This technical bulletin provides a procedure to replace the power steering pump and line to correct the customers concern of lack of steering assit when stopped or parking lot manuvers. Gmc/chevrolet/cadillac: vehicle fuel gauge inaccurate below 1/4 tank. on rare occasions, the vehicle has an inaccurate fuel gauge reading at 1/4 or a 1/8 of a tank. Clunking noise under hood and can be felt in steering wheel and/or steering column (replace upper intermediate steering shaft [i-shaft] assembly). Gear box power steering pump, p/s performance concerns. *nj updated on 6/30/2011. Abs light on, dtc's c0265, c0201, u1041 set and/or loss of communication with brake module. (reground ebcm ground). Service update for inventory and customer vehicles e85 virtual flex fuel sensor (vffs) update- reprogram ecm. Front blower motor inoperative or may not shut off in extremely low ambient temperature conditions. Left front axle shaft difficult to remove. axle differential leak seal shaft. Lr4, ly2, l33, lh6, lm7, l59, lc9, lmg, ly5, ls2, lq9, lq4, l76, ly6 throttle actuator control (tac). module codes, mil/ses dtc's p2108, p1516, u0107, reduced engine power. Revised upper control arm replacement. Ei05061 - intermediate steering shaft clunk noise or stick-slip (follow strategy based diagnostics). 05-02-35-003 and 05-02-35-003a not yet received. Brake pedal assembly replacement bracket service kit. updated 3/26/10. Service stability message on, diagnostic trouble code (dtc) c0131, c0196, c0290 and/or c0292 set. Clunking noise under hood and can be felt in steering wheel. *eh updated *eh updated. Anti-lock brake system (abs) light on, diagnostic trouble codes (dtcs) c0265, c0201, u1041 set and/or loss of communication with brake module. update. Diagnostic information for tire pressure monitoring (tpm) system which may set diagnostic trouble code (dtc) c0760 and/or c0765. updated 08-15-07. Antilock brake (abs) activation at low speeds (clean wheel speed sensor mounting surface). updated 10/23/09. Loss of ignition 1 voltage to the ignition coils. consumer experienced intermittent stall, misfire, or crank no start. there may be no trouble codes set. updated 3/17/09. Cadillac/chevrolet/gmc/hummer: some suvs and trucks are exhibiting a condition where by grinding/ratcheting type noise coming from automatic transmission when shifting into park while in 4wd low (4lo) range. Diagnostic information on mn8, mt1 ses/mil illuminated, dtc p0757, harsh shift, delayed 2-3 shift, 2-3 shift flare, no third gear, slips in third gear or reverse. Diagnostic information on mh1, mn8, mt1, m15 transmission slips, will not shift or may overheat, ses/mil may be illuminated, dtcs p0218, p0894 set. updated 8/12/08. Eaton locking differential chatter shudder noise on turns, equipped with a locking rear differential rpo g80. *nj updated 7/17/2008. No movement when the shift lever is moved to d4 or d3. normal operation when moved to d2 d1 or reverse. updated. 4l60-e/4l65-e automatic transmission/torque converter clutch (tcc) shudder, water in transmission. General motors service campaign: see document search button for owner letter. the hvac blower may not work at certain functions or may become inoperable. there could be a burning smell or smoke. updated 4/6/12. General motors corp: special coverage adjustment; analog onstar deactivation. updated 2/17/09. Door glass pops out of run channel. Information on vehicles with a stored history dtc b1259 antenna ground circuit. This technical bulletin provides a revision of 13-00-89-004 to update car issues information for reference information/bulletin pi0746c. This technical bulletin provides a revision of 05-02-32-008d to add 2013 model year vehicles. This informational bulletin provides information on close-coupled converter and engine replacement. Gm: information on fixing multiple situations right the first time. Buick\chevrolet\gmc service campaign: see document search button for owner letter. special coverage adjustment-analog onstar deactivation. csc letter was received. Gmc: sir mil dtc b0084 and/or b0085. this concern could be caused by broken seat position sensor circuits under the driver or passenger front seats. over time, from repeated seat movement, the wiring could break. Some customers may comment on various hvac concerns including temperature doors defaulting to full hot position or unable to obtain defrost position. P245/70r17 general ameritrac tire wear vibration. updated 12/13/07. *nj updated 1/30/08. *nj updated 5/25/11. Missing mercury disposal notice label. Wide load outside rear view mirror (rpo dpn) glass cracked, broken or fell out of mirror housing. Unable to disable auto door locks. 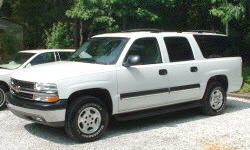 this includes 05 chevrolet gmc cadillac full size trucks and utilities. *eh also includes avalance, silverado suburban tahoe; gmc sierra, yukon, denali, yukon xl, denali xl. updated 8/26/08.